He’s against the Senate’s immigration reform plan. From the Gang of Eight Senate proposal: Give illegal immigrants a path to citizenship, putting them 10 to 15 years in line behind immigrants being ripped off by lawyers. Make them pay fines and fees from savings accounts they don’t have. In addition to popular Republican Marco Rubio endorsing the plan, there are more facets appealing to conservatives: the plan shows moral compassion for children brought to this country by relatives, the appearance of fair play and bringing people into the system as contributors to our society. Problem is, it likely will encourage more illegal immigration. As for securing the border before proceeding with any level of amnesty, who’s on the committee that decides the border is “secure?” How is “secured” measured? Robert Gittelson, President and co-founder of Conservatives for Comprehensive Immigration Reform, told me he believes the framework based on this proposal will be passed this year. It reflects the desire of all to get this done while securing the borders and upholding the rule of law. Daniel Stein, President of the conservative Federation for American Immigration Reform, hopes not. This sort of amnesty would encourage more illegal immigration, costing society billions. His solution? We already have a plan: enforce the e-Verify laws. And today? While one-third of new hires in Arizona were not even checked through e-Verify, the CATO Institute reports great improvements in the system. Currently, 98.3 percent of people pass E-Verify immediately. 1.7 percent of people who are flagged include a small number of legal, eligible workers. 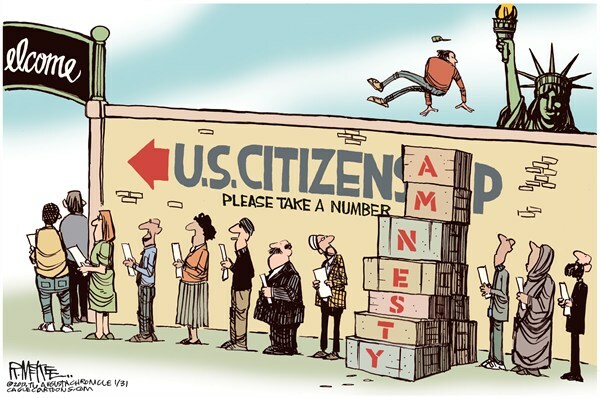 Nationwide, only about 7 percent of employers use the e-Verify system, which is unfortunate, as a dairy farmer in Arizona told a TV reporter that when federal agents inspected his records, they found 10 illegals working for him. They did not fine him, because he was trying to comply by using e-Verify. The best start to this might just be to successfully promote e-Verify to businesses in all states, publishing stories like this dairy farmer and showing guilty fat white guys busted for hiring illegals doing the perp-walk on every news outlet in the U.S.
4 Comments on "Rick Jensen, Guest Post"
National policy has to be about facts, numbers, statistics. There needs to be perspective. Exactly how big and bad is the problem? How much do we invest trying to fix it? Bad law usually comes from too much hype, panic, bad politics. Too much rush to pass a law to solve human nature problems. Let’s not do with the war on illegals what we did with the war on drugs. The population of the USA is around 330 million. An estimated 12 million are here illegally. That is not a crisis, unless of course you are a perfectionist. Perfection is a dangerous goal for government. The numbers tell us that even with “unsecured” borders, only around 3% of the population slipped in illegally. Not bad really. Probably less a percentage than WalMart shoplifting losses. Perspective is important. People have been migrating back and forth from Central and South America to North America for thousands of years. The US border with Mexico is only 170 years old. 500 million people live below our southern border. Mexico alone is 120 million people. 12 million slipped over the border to come to the USA. That means 2% of the population below the border managed to get here without proper paperwork. Here’s where we get back to good public policy has to be based on fact, not hype or panic. Or resentment. We can’t let seething animosity, racial bias lure us into vengeful policy that ends up costing us more than those we want to punish. Like Buddha says: Anger is like a hot coal. The longer we hold it, the more we burn ourselves. There’s a lot of unjustified anger bubbling around the immigration issue. Congressman Stockman is telling us local governments are going bankrupt, hospitals shutting down, schools overwhelmed, local economics crashed. Really? Depending on how you figure, there’s somewhere between 18,000 to 30,000 cities and towns in the USA. Exactly how many are going bankrupt because of illegal immigration? There are around 5000 hospitals in the USA. Congressman Stockman needs to tell us how many of those hospitals shut down because of illegals. There are around 100,000 public K-12 schools in the USA. How many of those schools are overwhelmed by illegals? Congressman Stockman claims local economies are are “crashing” because of illegals. That claim needs to be quantified. All the claims need to be substantiated. Put in perspective. Otherwise we may get some really misguided feel good very expensive new laws, but things will not change much. There’s a reason WalMart doesn’t spend all their time and profits combatting shoplifters. The private sector does cost analysis, they manage problems intelligently with numbers. We can take a tip from the private sector when it comes to figuring out how, and how much we invest managing the illegal immigrant problem. It is not a crisis, it’s something we can manage better. Mr. Holt, this is a guest post so please do not confuse my comments for a defense of the article or its content. However, your comment concerning the number of hospitals or local governments being crushed under the illegal immagrants coming here, are mis[eading. You state the number of hospitals nation wide as well as the number of schools and local governments and then use the unverifiable number of how many illegal immagrants are here. Remember, they are “undocumented”. You seem to feel that possibly there are no cities or hospitals, or schools suffering under the added pressure of these unknown illegals. You might feel differently if you lived in southern California or Texas or New Mexico. The fact is illegal immigrants come here to work because there are jobs and business owners hire them. Stockman proposes nothing to change that situation. Texas does not even mandate the use of eVerify for state hiring and given its proximity to the border, it’s a safe bet that some illegal immigrants are collecting a state paycheck. So Stockman, from the Party of No, has no solutions, no ideas, no nothing. Just like a lot of politicians from Texas – all hat, no cattle. Unfortunately, this is what GOP has become. A party with no ideas, no solutions, no nothing. What an embarassment! It really has become the joke party. All three commentators make the same valid point. Pragmatic reality is missing from the Republican Party. And because of it’s lack, when the American people get asked who can best fix their problems, they automatically turn to the other party. When i was young and full of idealism I sat down at the decision tables with those who had been around the block. They listened to my untried ideas simply based on idealism, and then did, what made them the most money…. As I became the bearer of more responsibility, I realized they were right. In life what matters is you survive. Dying for a noble cause that will be ridiculed in two years, is simply dying. Who wins? Those who can improve the lives of voters. i would recommend the Republican Party treat its idealists the same way I was treated when allowed to sit at the table… Politely listen, but by your actions, ignore them.